According to the Church of Jesus Christ of Latter-day Saints, the golden plates were sacred writings used to produce the authoritative translation of the Book of Mormon. These plates were allegedly discovered by Joseph Smith, Jr. on September 22, 1823, at the Cumorah Hill in New York state. Smith claimed that the plates had been hidden there for centuries by an angel named Moroni, who required Smith to obey certain commandments prior to receiving the plates. However, Smith's failure to obey the angel prevented him from obtaining the plates until September 22, 1827, four years later. Thereafter, Smith translated their contents and also began dictating the Doctrine and Covenants, including a commandment to form a new church, and to choose eleven men who would join Smith as witnesses of the plates. These witnesses declared, in a written statements attached to the 1830 published Book of Mormon, that they had seen the plates. However, their descriptions of the plates were not always consistent with each other. The golden plates are the most significant of metallic plates in Latter Day Saint history and theology. There are no extant plates for researchers to examine. Belief in their existence is a matter of faith. Although the Book of Mormon is generally accepted by adherents as a sacred text, not all Latter Day Saints view the plates as an ancient, physical artifact engraved by ancient prophets. Like the Ten Commandments carved on stone by Yahweh, assertions of the existence and authenticity of the golden plates are a matter of religious faith. Only men who were Joseph Smith's associates were allowed to become witnesses to the plates; he invited no strangers to inspect the plates. These witnesses, first a group of three, Martin Harris, Oliver Cowdery, and David Whitmer, and then a group of eight—five members of the Whitmer family, Joseph Smith's father, and two of his brothers, Hyrum and Samuel—all said they "saw and hefted" the plates. According to the Book of Mormon itself, the golden plates were engraved by two pre-Columbian prophet-historians from around the year 400 C.E. : Mormon and his son Moroni. Mormon and Moroni, the book says, had abridged earlier historical records from other sets of metal plates. Their script, according to the book, was called "reformed Egyptian" a language not known or recognized by Egyptologists or linguists, but which is described in the Book of Mormon as a language "altered… according to our manner of speech" and that "none other people knoweth our language" (Book of Mormon 9: 32-34). Part of the plates were said to have been sealed, and thus could not be translated. According to Joseph Smith, Moroni buried the plates just prior to his death, and they remained buried until, at the direction of God, Moroni led Joseph to them in a nearby hill in 1823. The story of Smith's finding and taking possession of the golden plates is taken from accounts by Smith and from interviews and writings of his contemporaries who heard the story. Many Latter Day Saint denominations have adopted official accounts. For example, The Church of Jesus Christ of Latter-day Saints officially recognizes a version of Smith's 1838 account, which the denomination has canonized in its scripture The Pearl of Great Price. During the Second Great Awakening, Joseph Smith, Jr. lived on his parents' farm near Palmyra, New York. This was a period where Christian churches in the region contended vigorously for followers; so much so that it became known as the "burned-over district" due to the fires of religion having burned it so often. It was also a region noted for its participation in a "craze for treasure hunting" by its citizenry. Beginning as a youth in the early 1820s, Smith was both recognized and paid to act as what was called a "seer," using seer stones in attempts to locate lost items and buried treasure earning about $14 per month. Smith later rejected his youthful treasure-hunting activities as frivolous and immaterial, but he "never repudiated the stones or denied their power to find treasure. Remnants of the magical culture stayed with him to the end." Smith's contemporaries described his method for seeking treasure as putting the stone in a white stovepipe hat, putting his face over the hat to block the light, and then "seeing" the information in the reflections of the stone. His first stone, which some said he also used later to translate the golden plates, was chocolate-colored and about the size of an egg, found in a deep well he helped dig for one of his neighbors. According to Smith, he found the plates only after a period of preparation during which an angel named Moroni allegedly appeared to him annually and finally directed him to their location. (According to the story, the angel's first visit occurred late at night in Smith's bedroom on September 22 in 1822 or 1823.) While Smith was thinking about his First Vision, Moroni appeared, and told him that the plates could be found buried in a prominent hill near his home later referred to as Cumorah. The angel would not allow Smith to take the plates until he was able to obey certain "commandments." Smith's writings say that the angel required at least the following commandments: (1) that he have no thought of using the plates for monetary gain, (2) that Smith tell his father about the vision, and (3) that he never show the plates to any unauthorized person. Smith's contemporaries who heard the story—both sympathetic and unsympathetic to Mormonism—generally agree that Smith mentioned the following additional commandments: (4) that Smith take the plates and go directly away from the burial site without looking back, and (5) that the plates never directly touch the ground until safe at home in a locked chest. In addition to the above, some unsympathetic listeners who heard the story from Smith or his father add that Smith said the angel required him (6) to wear "black clothes" to the site of the plates, (7) to ride a "black horse with a switchtail", (8) to call for the plates by a certain name, and (9) to "give thanks to God." In the morning, Smith began work as usual and did not mention the visions to his father because, he said, he did not think his father would believe him. Smith said he then fainted because he had been awake all night, and while unconscious, the angel appeared a fourth time and chastised him for failing to tell the visions to his father. When Smith then told all to his father, he believed his son and encouraged him to obey the angel's commands. Smith then set off to visit the hill, later stating that he used his seer stone to locate the place where the plates were buried, and he "knew the place the instant that [he] arrived there." At the proper location, the story goes, Smith saw a large stone covering a box made of stone or possibly iron. Using a stick to remove dirt from the edges of the stone cover, and after prying the cover up with a lever, he saw the plates inside the box, together with other artifacts. Joseph Smith said that the plates were engraved in an unknown language, and Smith told associates that he was capable of reading and translating them. This translation took place mainly in Harmony, Pennsylvania (now Oakland Township), Emma's hometown, where Smith and his wife had moved in October 1827 with financial assistance from a prominent, though superstitious, Palmyra landowner Martin Harris. The translation occurred in two phases: the first, from December 1827 to June 1828, during which Smith transcribed some of the characters and then dictated 116 manuscript pages to Harris, which were lost. The second phase began sporadically in early 1829 and then in earnest in April 1829 with the arrival of Oliver Cowdery, a schoolteacher who volunteered to serve as Smith's full-time scribe. In June 1829, Smith and Cowdery moved to Fayette, New York, completing the translation early the following month. Joseph Smith translating the golden plates. Smith used scribes to write the words he said were a translation of the golden plates, dictating these words while peering into seer stones, which he said allowed him to see the translation. Smith said that he translated using what he called the "Urim and Thummim"—a set of large spectacles with stones where the eye-pieces should be. There is no eye-witness testimony that Smith ever wore the large spectacles. Witnesses did observe Smith using a single seer stone (not part of a set of spectacles) in the translation, and some said that this stone was one of those Smith had earlier used for treasure seeking. Smith placed the stone (or the spectacles) in a hat, buried his face in it to eliminate all outside light, and peered into the stone to see the words of the translation. A few times during the translation, a curtain or blanket was raised between Smith and his scribe or between the living area and the area where Smith and his scribe worked. Sometimes Smith dictated to Martin Harris from upstairs or from a different room. Smith's process of what he called "translation" was not typical of the usual meaning of that word because his dictation of the English words did not require his understanding of the source text. As he looked into the seer stone, Smith said that the words of the ancient script appeared to him in English. These dictations were written down by a number of assistants including Emma Smith, Martin Harris, and most notably, Oliver Cowdery. In May 1829, after Smith had lent 116 un-duplicated manuscript pages to Martin Harris, and Harris lost them, Smith dictated a revelation explaining that Smith could not simply re-translate the lost pages because his opponents would attempt to see if he could "bring forth the same words again". Smith seems to have assumed that a second transcription of the lost pages should be identical to the first rather than be filled with the variants that would naturally occur if one was translating a text from one language into another in the normal manner. Smith did not require the physical presence of the plates in order to translate them; and many witnesses said the plates were hidden during the translation process, presumably in the woods. In early June 1829, the unwanted attentions of locals around Harmony necessitated Smith's move to the home of David Whitmer and his parents in Fayette, New York. Smith said that on this move the golden plates were transported by the angel Moroni, who placed them in the garden of the Whitmer house in Fayette where Smith could recover them. Translation was completed at the Whitmer home in Fayette. After translation was completed, Smith said he returned the plates to the angel, without elaboration. According to accounts by several early Mormons, a group of Mormon leaders including Oliver Cowdery, David Whitmer, and possibly others went with Smith to return the plates to a cave inside the Hill Cumorah. There, Smith is said to have placed the plates on a table near "many wagon loads" of other ancient records, and the Sword of Laban hanging on the cave's wall. According to Brigham Young's understanding which he said he heard from Cowdery, on a later visit to the cave, the Sword of Laban was said to be unsheathed and placed over the plates, and inscribed with the words "This sword will never be sheathed again until the kingdoms of this world become the kingdom of our God and his Christ." Smith said the angel commanded him not to show the plates to any unauthorized person. He reportedly expected that the first authorized witness would be his firstborn son, but his first child was stillborn in 1828. In March 1829, after pressure by Martin Harris to see the plates, Smith dictated a revelation stating that the words of the plates would be accompanied by the testimonies of three witnesses who would have the exclusive privilege to "view [the plates] as they are". Some time later, Smith’s dictation of the Book of Ether (chapter 2) also made reference to three witnesses, stating that the plates would be shown to them "by the power of God". Thus, in the second half of June 1829, Smith took Harris, together with Oliver Cowdery and David Whitmer (known collectively as the Three Witnesses), to the woods in Fayette, New York, where they said they allegedly saw an angel holding the golden plates and turning the leaves. The four of them also said they heard the voice of the Lord telling them that the translation of the plates was correct, and commanding them to testify of what they saw and heard. A few days later, Smith selected a group of Eight Witnesses, the males of the Whitmer home, including David Whitmer's father Peter, his brothers Christian, Jacob, and John, and his brother-in-law Hiram Page. Smith took this group, along with his father Joseph Smith, Sr. and his brothers Hyrum and Samuel to a location near Smith's parents' home in Palmyra where they said Smith showed them the golden plates. When the Book of Mormon was published in 1830, the book included one affidavit testifying to the experience of the Three Witnesses and another affidavit of the Eight Witnesses. There is no evidence that these two affidavits were actually signed by either group, and these statements were apparently drafted by Joseph Smith. In March 1838, some church members said that Martin Harris, who had previously given specific descriptions of the plates, now publicly denied having seen them at all. Near the end of his long life, Harris also said that he had seen the plates only in "a state of entrancement". Nevertheless, in 1871 Harris testified that no one had "ever heard me in any way deny the truth of the Book of Mormon [or] the administration of the angel that showed me the plates". The plates were said to be bound at one edge by a set of rings. In 1828, Martin Harris, one of Joseph Smith, Jr.'s early scribes, is reported to have said that he understood the plates to be "fastened together in the shape of a book by wires". In 1859, Harris said that the plates "were seven inches [18 cm] wide by eight inches [20 cm] in length, and were of the thickness of plates of tin; and when piled one above the other, they were altogether about four inches [10 cm] thick; and they were put together on the back by three silver rings, so that they would open like a book". David Whitmer, another 1829 witness, was quoted by an 1831 Palmyra newspaper as saying the plates were "the thickness of tin plate; the back was secured with three small rings…passing through each leaf in succession". Anomalously, Smith's father is quoted as saying the (stack of?) plates (were?) only half an inch (1.27 centimeter) thick while Smith's mother, who said she had "seen and handled" the plates, is quoted as saying they were "eight inches [20 cm] long, and six [15 cm] wide… all connected by a ring which passes through a hole at the end of each plate". Hyrum Smith and John Whitmer, also witnesses in 1829, are reported to have stated that the rings holding the plates together were, in Hyrum's words, "in the shape of the letter D, which facilitated the opening and shutting of the book". Joseph Smith's wife Emma and his younger brother William said they had examined the plates while wrapped in fabric. Emma said she "felt of the plates, as they thus lay on the table, tracing their outline and shape. They seemed to be pliable like thick paper, and would rustle with a metallic sound when the edges were moved by the thumb, as one does sometimes thumb the edges of a book". Joseph Smith did not provide his own published description of the plates until 1842, when he said in a letter that "each plate was six inches [15 cm] wide and eight inches [20 cm] long, and not quite so thick as common tin. They were… bound together in a volume, as the leaves of a book, with three rings running through the whole. The volume was something near six inches [15 cm] in thickness". The plates were first described as "gold," and beginning about 1827, the plates were widely called the "gold bible." When the Book of Mormon was published in 1830, the Eight Witnesses described the plates as having "the appearance of gold". However, late in life, Martin Harris stated that the rings holding the plates together were made of silver, and he said the plates themselves, based on their heft of "forty or fifty pounds" (18–23 kg), "were lead or gold." Joseph's brother William Smith, who said he felt the plates inside a pillow case in 1827, said in 1884 that he understood the plates to be "a mixture of gold and copper… much heavier than stone, and very much heavier than wood". According to Joseph Smith, Jr., and others, the book of Golden Plates contained a "sealed" portion containing "a revelation from God, from the beginning of the world to the ending thereof" (Book of Mormon, 2 Nephi 27:7). Smith never described the nature or extent of the seal, and the language of the Book of Mormon may be interpreted to describe a sealing that was spiritual, metaphorical, physical, or a combination of these elements. The Book of Mormon refers to other documents and plates as being "sealed" by being buried in order to be revealed at some future time. For example, the Book of Mormon says the entire set of plates was "sealed up, and hid up unto the Lord", and that separate records of John the Apostle were "sealed up to come forth in their purity" in the end times. One set of plates to which the Book of Mormon refers was "sealed up" in the sense that they were written in a language that could not be read. Smith may have understood the sealing as a supernatural or spiritual sealing of the plates "by the power of God" (2 Nephi 27:10). This idea is supported by a reference in the Book of Mormon to the "interpreters" (Urim and Thummim) with which Smith said they were buried or "sealed". Oliver Cowdery also stated that when Smith visited the hill, he was stricken by a supernatural force because the plates were "sealed by the prayer of faith". Several witnesses described a physical "sealing" placed on part of the plates by Mormon or Moroni. David Whitmer said that an angel showed him the plates in 1829 and that "a large portion of the leaves were so securely bound together that it was impossible to separate them". He also said that the "sealed" part of the plates were held together as a solid mass that was "stationary and immovable" "as solid to my view as wood", and that there were "perceptible marks where the plates appeared to be sealed" with leaves "so securely bound that it was impossible to separate them". Lucy Mack Smith said in 1842 that some of the plates were "sealed together and are not to be opened, and some of them are loose". The account of the Eight Witnesses says they saw the plates in 1829 and handled "as many of the leaves as [Joseph] Smith has translated," implying that they did not examine untranslated parts of the book such as the sealed portion. In one interview, David Whitmer said that "about half" the book was sealed, and in 1881, he said that "about one-third" of the book was unsealed, and the remainder sealed.< Whitmer's 1881 statement is consistent with an 1856 statement by Orson Pratt, an associate of Smith's who never saw the plates himself, but who said he had spoken with witnesses. According to Pratt, "about two-thirds" of the plates were "sealed up". The sealed portion of the plates is said to contain "a revelation from God, from the beginning of the world to the ending thereof" (Book of Mormon, 2 Nephi 27:7). The Book of Mormon states that this vision was originally given to the Brother of Jared, recorded by Ether on a set of 24 plates later found by Limhi, and then "sealed up" (Book of Mormon, Ether 1:2). According to this account, Moroni copied the plates of Limhi onto the sealed portion of the Golden Plates. The Golden Plates were said to contain engravings in an ancient language that the Book of Mormon (9:32) describes as Reformed Egyptian. Smith later described the writing as "Egyptian characters… small, and beautifully engraved," exhibiting "much skill in the art of engraving". John Whitmer, one of the Eight Witnesses, said the plates had "fine engravings on both sides", and Orson Pratt, who did not see the plates himself but who had spoken with witnesses, understood that there were engravings on both sides of the plates, "stained with a black, hard stain, so as to make the letters more legible and easier to be read". Since Joseph Smith's announcement that he had received golden plates from an angel, non-believers have challenged their reality. Mormon scholars have argued that other ancient civilizations wrote sacred records on metal plates. Some ancient European and Mesopotamian cultures did keep short records on metal plates, but extant examples are rare, have comparatively brief texts, and are extremely thin. A six-page, 24-carat gold book, written in Etruscan, was found in Bulgaria; and in 2005, an eight-page golden codex, allegedly from the Achaemenid period, was recovered from smugglers by the Iranian police. The Pyrgi Tablets (now at the National Etruscan Museum, Rome) are gold plates with a bilingual Phoenician-Etruscan text. Gold Laminae funerary texts similar to Books of the Dead have also been found in Italy. In the caves where the Dead Sea Scrolls had been found, archeologists later discovered the aptly-named Copper Scroll, two rolled sheets of copper that may describe locations where treasures of the Second Temple of Jerusalem may have been hidden. Another Israelite example is the tiny "Silver Scrolls" dated to the seventh century B.C.E. (First Temple period), containing just a few verses of scripture, perhaps the oldest extant passages of the Old Testament. Nevertheless, there is no known extant example of writing on metal plates longer than the eight-page Persian codex and no extant metal plates with writing from Egypt or from any ancient civilization in the Western Hemisphere. ↑ James Gordon Bennett, Jr., 1893, The New York Herald, June 25, 1893. Mormon Leaders at Their Mecca. "READINGS IN EARLY MORMON HISTORY- New York Newspapers." sidneyrigdon.com. Retrieved March 2, 2009. ↑ Joseph Smith, Jr., "Editor's note," Elders' Journal of the Church of Jesus Christ of Latter Day Saints. 1 (3) (July 1838), 42–43 (stating that he was what he called a "money digger," but saying that it "was never a very profitable job to him, as he only got 14 dollars a month for it"). ↑ Richard Lyman Bushman. 2005. Joseph Smith: Rough Stone Rolling. (New York: Knopf, ISBN 1400042704), 50–51; Shipps, 1987, 11. ↑ Abigail Harris, 1833, "Affidavit of Abigail Harris", in Eber Dudley Howe. Mormonism Unvailed. Painesville, Ohio: Telegraph Press at 253-254. Spaulding Special Collections Retrieved March 2, 2009; Isaac Hale, 1834, "Affidavit of Isaac Hale. Spaulding Special Collection. Retrieved March 2, 2009; Bushman, 2005, 50–51, 54–55. ↑ Smith referred to the visitor as an "angel of the Lord" at least as early as 1832. Joseph Smith, Jr. (1832), "History of the Life of Joseph Smith", in Dean C. Jessee. Chapter: Writings of Joseph Smith, (Salt Lake City: Deseret Book, 1832. ISBN 1573457876), 4, and possibly as early as 1829 (Early Mormon Documents 1:151-152). Some early accounts related by non-Mormons described this angel as a "spirit" (Jonathan A. Hadley, "Golden Bible" The Palmyra Freeman, August 11, 1829; Harris, 1833, 253; Willard Chase. 1833, "Testimony of Willard Chase." in Eber Dudley Howe. Mormonism Unvailed. (Painesville, Ohio: Telegraph Press), 240–248. 242) or a "ghost": David S. Burnett, "Something New.—Golden Bible," Evangelical Inquirer 1(10) (March 7, 1831); see also Joseph Lewis and Hiel Lewis, (April 30, 1879), "Mormon History", Amboy Journal 24 (5), online,  (a later-published account using the "ghost" terminology). In 1838, however, Smith later said that the "angel" was a man who had been "dead, and raised again therefrom" Smith, 1838b, 42–43. ↑ Hadley, 1829; Smith, 1838a, 6. ↑ There is agreement on this commandment by Smith's mother Lucy Mack Smith, Sketches of Joseph Smith the Prophet, and His Progenitors for Many Generations. (Liverpool: S.W. Richards, 1853); Smith, 1853, 85–86; and sister Katharine Smith Salisbury. (1895), "Katharine Smith Salisbury's Recollections of Joseph's Meetings with Moroni." BYU Studies 41(3) (2002): 4–17, 14; and by two non-Mormons (Chase, 1833, 242; [La]Fayette Lapham, (1870), "Interview with the Father of Joseph Smith, the Mormon Prophet, Forty years Ago. His Account of the Finding of the Sacred Plates", Historical Magazine [second series 7 (1870): 305-309. ], 305. ↑ Chase, 1833, 242 (an affidavit of Willard Chase, a non-Latter Day Saint treasure seeker who believed Smith wrongly appropriated his seer stone). Chase said he heard the story from Smith's father in 1827. Fayette Lapham, who traveled to Palmyra in 1830 to inquire about the Latter Day Saint movement and heard the story from Joseph Smith, Sr., said Smith was told to wear an "old-fashioned suit of clothes, of the same color as those worn by the angel," but Lapham did not specify what color of clothing the angel was wearing Lapham, 1870, 305. ↑ Chase, 1833, 242 (affidavit of the skeptical Willard Chase). ↑ Smith, 1853, 82; Salisbury, 1895, 12 (stating that Smith told the angel during the fourth visit that he was afraid his Father would believe him). ↑ Smith, 1853, 82; Smith, 1838a, 6. ↑ Smith, 1853, 82. Smith's brother William, who was 11 at the time, said he also told the rest of his family that day prior to visiting the hill. Smith, 1883, 9–10, although he may have been remembering Smith tell the story the night after he visited the hill, according to their mother's recollection. Smith's sister Katharine said that Joseph told his father and the two oldest brothers Alvin and Hyrum the morning prior to visiting the hill, but Katharine was too young (ten years old) to understand what they were talking about Salisbury, 1895, 13. ↑ Harris, 1833, 252 (statement were by Henry Harris, a non-Mormon Palmyra resident); Harris, 1859, 163 (statement by Martin Harris, a Latter Day Saint who became one of the Three Witnesses of the Golden Plates). According to one hearer of the account, he used the seer stone to follow a sequence of landmarks by horse and on foot until he arrived at the place the plates were buried.Lapham, 1870, 305. ↑ Most accounts, including those written by Smith, say the plates were found in a stone box: Oliver Cowdery, 1835b "Letter VIII", Latter Day Saints' Messenger and Advocate 2 (1): 195–202. 196; Smith, 1838a, 15–16; John C. Whitmer, 1875, "The Golden Tables," Chicago Times, (August 7, 1875) calling it a "stone casket," and stating that Smith had to dig down for the box "two and a half or three feet"); according to two non-believing witnesses, however, Smith said they were buried in an iron box (Bennett, 1831, 7) ed., "James Gordon Bennett's 1831 Report on 'The Mormonites'" (PDF), BYU Studies 10 (3): 353–364 (1–10 in reprint), [https://byustudies.byu.edu/shop/PDFSRC/10.3Arrington.pdf . .
↑ Smith, 1838a, 15–16. According to various accounts, these artifacts may have included a breastplate (Cowdery, 1835b, 196; Smith, 1838a, 16; saying it was the "breast-plate of Laban"), a set of large spectacles made of seer stones (Chase, 1833, 243; Smith, 1838a, 16), the Liahona, the sword of Laban (Lapham, 1870, 306, 308; Salisbury, 1895, 13), the brass plates of Laban (Salisbury, 1895, 13), the vessel in which the gold was melted, a rolling machine for gold plates, and three balls of gold as large as a fist. Harris, 1833, 253. ↑ The local Presbyterian minister, Jesse Townsend, described Harris as a "visionary fanatic." A acquaintance, Lorenzo Saunders, said, "There can't anybody say word against Martin Harris… a man that would do just as he agreed with you. But he was a great man for seeing spooks." Ronald W. Walker (1986), . "Martin Harris: Mormonism's Early Convert", Dialogue: A Journal of Mormon Thought 19 (4): 29–43. 35. ↑ Early followers of Smith used the term Urim and Thummim to refer both to these large spectacles and Smith's other seer stones, most notably one commonly called the "Chase stone" that Smith had found in a Palymra well during the early 1820s: Richard S. Van Wagoner, "Joseph Smith: The Gift of Seeing", Dialogue: A Journal of Mormon Thought 15 (2)(Summer 1982) : 48–68, , 59–62. ↑ Hale, 1834, 265; Smith, 1879, 536-540; Wagoner, 1982, 59–62 (containing an overview of witnesses to the translation process). ↑ Smith's father-in-law, Isaac Hale, said that the "manner in which he pretended to read and interpret was the same as when he looked for the money-diggers, with the stone in his hat, and his hat over his face, while the Book of Plates were at the same time hid in the woods!" Hale, 1834, 265. ↑ Whitmer, 1875 ("Having placed the Urim and Thummim in his hat, Joseph placed the hat over his face, and with prophetic eyes read the invisible symbols syllable by syllable and word by word."). Michael Morse, Smith's brother-in-law, stating that he watched Smith on several occasions: "The mode of procedure consisted in Joseph's placing the Seer Stone in the crown of a hat, then putting his face into the hat, so as to entirely cover his face." (Wagoner, 1982, 52–53, quoting W.W. Blair, Latter Day Saints' Herald 26 (Nov. 15, 1879): 341, who was quoting Michael Morse). Smith's wife Emma stated that she took dictation from her husband as she sat next to him, and that he would put his face into a hat with the stone in it, dictating for hours at a time. Smith, 1879, 536-540. ↑ Cook, 1991, 173. However, Elizabeth Ann Whitmer, later to be the wife of scribe Oliver Cowdery, said she had never seen a curtain raised between Smith and Cowdery or her brothers while translation took place in the Whitmer home Wagoner, 1982, 51. 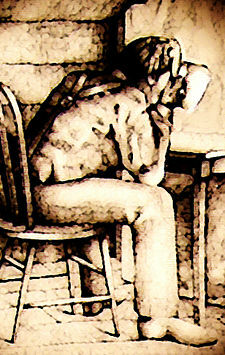 ↑ Clark (1842) ("Although in the same room, a thick curtain or blanket was suspended between them, and Smith concealed behind the blanket, pretended to look through his spectacles, or transparent stones, and would then write down or repeat what he saw, which when repeated aloud, was written down by Harris. 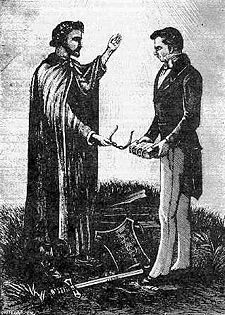 "); Benton, 1831 ("Oliver Cowdery, one of the three witnesses to the book, testified under oath, that said Smith…translated his book [with] two transparent stones, resembling glass, set in silver bows. That by looking through these, he was able to read in English, the reformed Egyptian characters, which were engraved on the plates."). ↑ William W. Phelps, 1833, 24. ↑ Grant h. Palmer. An Insider's View of Mormon Origins. (Salt Lake City: Signature Books, 2002. 1560851570), 7. ↑ Stevenson, 1882; Hale, 1834, 264–65; Van Horn, 1881; Whitmer, 1875 ("The plates were not before Joseph while he translated, but seem to have been removed by the custodian angel."). Isaac Hale said that while Joseph was translating, the plates were "hid in the woods" Hale, 1834, 264. Joseph Smith, Sr. said they were "hid in the mountains" Palmer, 2002, 2-5. ↑ Smith, 1853, 137; Salisbury, 1895, 16. ↑ Young, 1877, 38; Packer, 2004, 52, 55. ↑ Young, 1877, 38. (Young said he heard this from Oliver Cowdery). ↑ Chase, 1834 (citing Martin Harris as stating in 1829 that Smith’s unborn son would translate the plates at the age of two (this son was stillborn), and thereafter, "you will see Joseph Smith, Jr. walking through the streets of Palmyra, with the Gold Bible under his arm, and having a gold breast-plate on, and a gold sword hanging by his side. "); Hale, 1834, 264 (stating that the first witness would be "a young child”). ↑ Phelps, 1833, 37; Smith, 1853; Smith, 1883, 14. Berge 1985. Roberts (1902, p. 57). (Smith & 1830b appendix) . ↑ This is the conclusion of Palmer (2002, p. 195-96), who compared "The Testimony of Three Witnesses" to part of the Doctrine and Covenants written in 1829 (first published at Smith et al. (1835, p. 171)), and concluding that they show "the marks of common authorship." Palmer also compares a letter from Oliver Cowdery to Hyrum Smith dated June 14 1829, quoting the language of this revelation (Joseph Smith letterbook (22 November 1835 to 4 August 1835), 5-6). Commentators generally agree that this letter refers to the revelation. See Larry C. Porter, "Dating the Restoration of the Melchizedek Priesthood," Ensign (June 1979), 5. ↑ Metcalf in EMD, 2: 347. ↑ Abner Cole, "Gold Bible, No. 6," The [Palmyra] Reflector II (16) (March 19, 1831). ↑ Statement by Hyrum Smith as reported by William E. McLellin in the Huron Reflector (October 31, 1831). See also Poulson, 1878. ↑ Smith, 1830; Harris, 1859, 167; Smith, 1853, 102, 109, 113, 145; Cole, 1831. ↑ Chase, 1833, 246; Lapham, 1870; Smith, 1883. ↑ Book of Mormon, Ether 3:22. ↑ D. Michael Quinn. Early Mormonism and the Magic World View, 2nd ed., (Salt Lake City: Signature Books, 1998. ISBN 1560850892), 195–196. ↑ Book of Mormon, Ether 4:5. According to Martin Harris, anyone who looked into the "interpreters," "except by the command of God," would "perish" Harris, 1859, 166. ↑ David Whitmer interview, Chicago Tribune, 24 January 1888, in David Whitmer Interviews, ed. Cook, 221. Near the end of his life, Whitmer said that one section of the book was "loose, in plates, the other solid." Wilbur F. Storey, , 1881. ↑ P. Wilhelm Poulson, "Letter to the editor," (1856) Deseret Evening News (August 6, 1878). ↑ Whitmer, 1888. Orson Pratt, who said he had spoken with many witnesses of the plates, Pratt, 1859, 30, assumed that Joseph Smith could "break the seal" if only he had been "permitted" Pratt, 1877, 211–12. ↑ Cole, 1831; Poulson, 1878. ↑ William J. Hamblin, "Sacred Writing on Metal Plates in the Ancient Mediterranean", Neil A. Maxwell Institute for Religious Scholarship, Brigham Young University. Retrieved on 2008-03-18. ↑ Unique book goes on display. BBC News, 2003-05-23. Retrieved on 2008-03-18. ↑ Mesoamerican writing systems have been preserved only on stone or paper made from bark or deerskin. Encyclopedia of Archaeology (Oxford: Elsevier, 2008), 2231; Ruth D. Whitehouse, (ed.) Facts on File of Archaeology (New York: Facts on File, 1983), 553. In the section of the Oxford Encyclopedia of Ancient Egypt (Oxford, 2001), dedicated to metallurgy, the writer notes implements of all kinds in copper, bronze, and gold, including daggers, ewers, chisels, mirrors, statuettes and jewelry of all types. No plates with writing are mentioned. Anthon, Charles. Mormonism Unvailed: or, A Faithful Account of That Singular Imposition and Delusion, from Its Rise to the Present Time. Painesville, OH: Telegraph Press, 1834. Bennett, James Gordon, Jr., 1893, The New York Herald, June 25, 1893. Mormon Leaders at Their Mecca. Retrieved March 2, 2009. Burnett, David S. "Something New.—Golden Bible," Evangelical Inquirer 1(10), March 7, 1831. solomonspalding.com. Bushman, Richard Lyman. Joseph Smith: Rough Stone Rolling. New York: Knopf, 2005. ISBN 1400042704. Chase, Willard. "Testimony of Willard Chase." in Eber Dudley Howe. Mormonism Unvailed. Painesville, OH: Telegraph Press, 1833. at 240–248. Chicago Daily Tribune, (obituary of David Whitmer) "An Old Mormon's Closing Hours: David Whitmer, One of the Pioneers of That Faith, Passing Away," Chicago Daily Tribune (January 24, 1888), 5. Clark, John A. Gleanings by the Way. Philadelphia: W.J. & J.K. Simmon. 1842. Cobb, James T. "The Hill Cumorah, And The Book Of Mormon. The Smith Family, Cowdery, Harris, and Other Old Neighbors—What They Know." The Saints' Herald 28 (11) (June 1, 1881): 167. boap.org. Cook, Lyndon W. David Whitmer Interviews: A Restoration Witness. Orem: Grandin, 1991. Cowdery, Oliver, "Letter [I", Latter Day Saints' Messenger and Advocate 1 (1)(1834): 13–16.]. centerplace.org. __________. (1834b), "Letter III", Latter Day Saints' Messenger and Advocate 1 (3): 41–43. __________. (1835a), "Letter IV", Latter Day Saints' Messenger and Advocate 1 (5): 77–80. __________. (1835b), "Letter VIII", Latter Day Saints' Messenger and Advocate 2 (1): 195–202. Crystal, David. The Cambridge Encyclopedia of Language. Cambridge University Press, 1997. Daniels, Peter T., & William Bright, eds. The World's Writing Systems. Oxford University Press, 1996. ISBN 9780195079937. Hale, Isaac, "Affidavit of Isaac Hale". Retrieved August 29, 2009. also in Eber Dudley Howe. Mormonism Unvailed, Painesville, OH: Telegraph Press, 1834. at 262–266. Harris, Abigail. (1833), "Affidavit of Abigail Harris" xmission.com. also in Eber Dudley Howe. Mormonism Unvailed. Painesville, OH: Telegraph Press, at 253–254. Harris, Henry (1833), "Affidavit of Henry Harris", in Howe, Eber Dudley, Mormonism Unvailed. Painesville, OH: Telegraph Press, at 251–253. Knight, Joseph, Sr. in (1833), Dean Jessee, ed., "Joseph Knight's Recollection of Early Mormon History", BYU Studies 17 (1) (1976): 35. Lewis, Joseph, and Hiel Lewis, (April 30, 1879), "Mormon History", Amboy Journal 24 (5), (a later-published account using the "ghost" terminology). Packer, J. Cameron, "Cumorah's Cave", Journal of Book of Mormon Studies 13 (1)(2004): 50–57. Maxwell Institute. Palmer, Grant H. An Insider's View of Mormon Origins. Signature Books, 2002. 1560851570. Phelps, William W., A Book of Commandments, for the Government of the Church of Christ, Zion: William Wines Phelps & Co., 1833. irr.org. Pratt, Orson, "The Faith and Visions of the Ancient Saints—The Same Great Blessing to be Enjoyed by the Latter-day Saints", Journal of Discourses III: 344–353. __________. "Evidences of the Bible and Book of Mormon Compared", Journal of Discourses VII (1859): 22–38. __________. "King Limhi's Enquiry, from the Book of Mormon", Journal of Discourses XIX (1877) : 204–219. Quinn, D. Michael. Early Mormonism and the Magic World View, 2nd ed., Salt Lake City: Signature Books, 1998. ISBN 1560850892. Riley, I. Woodbridge, The Founder of Mormonism: A Psychological Study of Joseph Smith, Jr. New York: Dodd, Mead & Co., 1903. books.google. Roberts, B. H. (1902), ed., of the Church of Jesus Christ of Latter-day Saints (vol. 1) The Church of Jesus Christ of Latter-day Saints. Book of Abraham Project boap.org. __________. History of the Church of Jesus Christ of Latter-day Saints (vol. 3). The Church of Jesus Christ of Latter-day Saints. 1906. boap.org. Robinson, Andrew. Lost Languages: The Enigma of the World's Undeciphered Scripts. New York: McGraw Hill, 2002. ISBN 0071357432. Shipps, Jan. Mormonism: The Story of a New Religious Tradition. University of Illinois Press, 1987. ISBN 0252014170. Smith, Joseph, III. " Last Testimony of Sister Emma," The Saints' Herald 26: 19 (October 1, 1879): 289. Smith, Joseph, Jr. The Book of Mormon: An Account Written by the Hand of Mormon, Upon Plates Taken from the Plates of Nephi. Palmyra, NY: E. B. Grandin. 1830. __________. (1832), "History of the Life of Joseph Smith", in Dean C. Jessee. Chapter: Writings of Joseph Smith, Salt Lake City: Deseret Book, ISBN 1573457876. __________. Oliver Cowdery & Sidney Rigdon et al. (1835), and Covenants of the Church of the Latter Day Saints: Carefully Selected from the Revelations of God, Kirtland, Ohio: F. G. Williams & Co..
__________. History_of_the_Church/A-1&oldid=399581History of the Church, copied to Smith, Joseph, Jr.; James Mulholland & Robert B. Thompson, et al. (April 1838), (1839–1843), "History of the Church, Ms. A–1", in Dean C. Jessee, ed. Personal Writings of Joseph Smith. Deseret Book, 2002. ISBN 1573457876. __________. "Editor's note," Elders' Journal of the Church of Jesus Christ of Latter Day Saints. 1 (3) (July 1838). __________. " Church History [Wentworth Letter," Times and Seasons 3 (9) (March 1, 1842): 906–936]. books.google. Smith, Lucy Mack (1842b), in Henry Casawall. The City of the Mormons; or, Three Days at Nauvoo, in 1842. London: J.G.F. & J. Rivington, 1842.]. books.google. __________. (1853), Sketches of Joseph Smith the Prophet, and His Progenitors for Many Generations, Liverpool: S.W. Richards. Smith, William, William Smith on Mormonism: A True Account of the Origin of the Book of Mormon, Lamoni, Iowa: RLDS Church, (1883). olivercowdery.com. __________. "The Old Soldier's Testimony", The Saints' Herald 34 (39)(1884): 643–644. Stevenson, Edward. "One of the Three Witnesses: Incidents in the Life of Martin Harris", The Latter Day Saints' Millennial Star 44 (1882) : 78–79, 86–87. Turner, Orasmus. History of the Pioneer Settlement of Phelps and Gorham's Purchase, and Morris' Reserve. Rochester, NY: William Alling, 1851. Van Wagoner, Richard S. (1982), "Joseph Smith: The Gift of Seeing", Dialogue: A Journal of Mormon Thought 15 (2): 48–68. Walker, Ronald W. "Martin Harris: Mormonism's Early Convert", Dialogue: A Journal of Mormon Thought 19 (4)(1986) : 29–43. Whitmer, David. "An Address to All Believers in Christ By A Witness to the Divine Authenticity of the Book of Mormon (1887). Retrieved February 16, 2009. "The Priesthood and Satan—the Constitution and Government of the United States—Rights and Policy of the Latter-day Saints." Journal of Discourses by Brigham Young, 2 (February 18, 1855): 179–190. "Trying to Be Saints—Treasures of the Everlasting Hills—The Hill Cumorah—Obedience to True Principle the Key to Knowledge—All Enjoyment Comes from God—Organization—Duties of Officers—Final Results." Journal of Discourses by Brigham Young, 19 (June 17, 1877):36–45. This page was last modified on 24 June 2017, at 15:59.